This has been a very exciting month for us. We invested (don't ya love it when people say "invested"?) 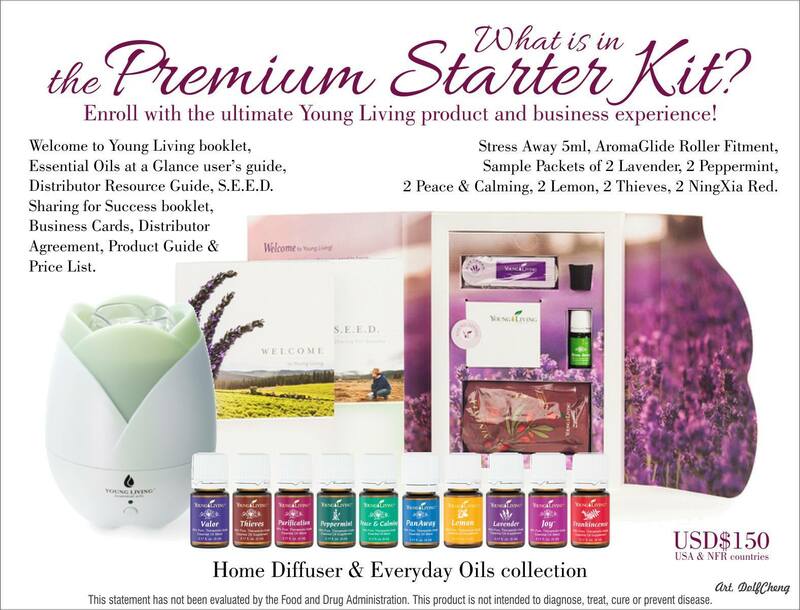 in the Premium Starter Kit for the Young LIving Essential Oils. I say "invested" because at first glance, the cost of $150 is enough to warrant the word "invested". It strikes fear in the pocketbook of misers like me. If you know me well it's like trying to squeeze blood out of a turnip to get a buck out of me. Well, after I read about the benefits of Essential Oils and saw how they worked on some of my kids and grandkids I became a believer! So my "No way," turned into a "I gotta get me some of them thar oils!" I kid you not, I paid the $150 + shipping/handling and got the kit. I finally have something I can use for our physical and even our mental/emotional needs. No, I'm not a basket case that needs a therapist and mood altering substances…well, wait, maybe I am. But my main need is to find something to turn to other than traditional medicine. We have no medical insurance, haven't had in several years, so It's always been a desire of mine to steer clear of the doctor's office. The kit contains 10 Essential Oils that you can try out without committing a bunch of money to buy the big bottles. They are 5 ml, so they are good enough sized to last you a while. There's a bunch of other stuff in there too, but the second best part besides the oils is the diffuser. I've only had the EOs a short time but have been so impressed that I just need to spread the word! I started out with the Lavender oil. Because I have Fibromyalgia (bet most of you didn't know that!) I have some of the many sleep disorders associated with Fibro…trouble falling asleep, maintaining REM, staying asleep, and trouble going back to sleep if I awaken during the night. I don't know the technical terms I (avoid the doctor, remember?) so bear with me. Lavender is a sleep aid so when I tried it I was amazed at how deeply I slept and how rested I felt the next morning. I added Peace and Calming oil the next week and it helped me fall asleep much faster. All I did was apply a drop or two of each on my neck and Lavender on my cheek so I could breathe it in. One night I put some on my pillow. Two nights ago I said goodbye to two of my sleep aids! I will continue using my Melatonin, but am thinking I'll eventually lose that too. So far I have used Lavender, Peppermint and Purification in my diffuser. The first two smell amazingly wonderful, the Purificaiton not so much, but it did rid my livingroom of the paint smell when I brought my painted projects in from the cold to dry in my kitchen. It also got rid of the little boy smell when my grandsons came over and blessed me with their lovely room scenting ability. Here is a video that will give you an intro to the oils. Don't buy without telling Young Living I referred you! April and I are building an EO community of family and friends so we can work together to become EO experts by exchanging ideas and experiences. We want you in our group. So if you decide to buy the kit, click here and use my ID number when you order. If you just want to check out their website, click the Home button at the top and it will take you to their front page. Then come back to get my ID number here if you are going to order the kit. It really is the best deal to get started. I am very excited for you! I plan to order this book: Essential Oils Pocket Reference Legacy as soon as our group gets together and makes a bulk order. See…there's one advantage in joining up with us! We also have an online Facebook info event this week for those interested in the oils and being in our EO group. Advantage #2! I am co-hosting the Facebook question and answer EO party. If you are interested in attending, let me know and I will see you get an invitation. We will be discussing the benefits of the oils that come in the kit I mentioned above – the Premium Starter Kit. If you want to know more, this is the way to get a jump start. I would appreciate some comments about how you've used Essential Oils and what you think of them. There are so many of us out there that want to learn more! Melissa says, "We use Tea Tree Oil for in-grown nails, started using it on a skin issue which seems to be clearing it up when a prescription wasn't working, and also used it in the shower to help with hubby's callused feet!! We use Lavender to soothe and help us sleep, we also sprinkle it on our bed sheets and pillow cases to help disinfect. We use Eucalyptus and Peppermint on bottoms of feet to stop coughing to sleep at night. Eucalyptus works well in the shower to clear a stuffy nose!" "We use Lavender with coconut oil for eczema and Peppermint on the abdoment for acid reflux, stomach aches, constipation, and fever. Panaway works well for our muscle aches and pains. We've used Frankinsense, Peppermint, and Thieves for colds and Stress Away or Peace and Calming for stress and/or anxiety." Once again, let me know what you use the Essential Oils for in the comments. I love comments and read every one. Click here if you are interested in getting the Premium Starter Kit and discounts on additional orders. Don't let Thieves steal your Joy!